Do you wonder about drilling glass, including sea glass? Here are positive comments, tips, and suggestions gathered from our readers over the years on how to drill glass. Have you wondered whether you have the ability to drill holes in sea glass without seriously injuring yourself or others? Have you visualized glass shards all over the floor and yourself reduced to tears? Don't give up before you try it! You CAN learn how to drill glass. 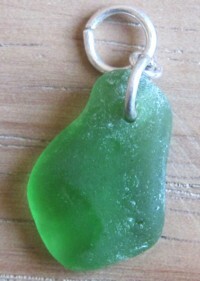 From what we have read and reviewed from you, our readers, learning how to drill sea glass was not that hard. Many had questions about what types of drill and bits to use. They all found that drilling sea glass does not require a "Glass Drillers Degree" or any special arts/crafts genius in order to produce great results. 1. Who needs an expensive machine for drilling holes in sea glass! 2. Drilling sea glass - how long? 3. Good drill bit for drilling into small pieces of sea glass? Glass pieces with holes and the drill bit for glass and tile . In her original post, Toshi talks ahout looking for a drill and bit. She ends up happy with a regular electric handheld drill and a bit for tile and glass from the hardware store. For her full comment, see Toshi's original report. Click here to add your own comments on how to drill glass. Toshi, thank you for the tips on saving money on the drill! 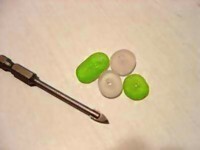 As you state, a regular electric handheld drill will work for drilling sea glass. 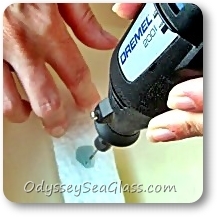 With one of those electric drills you already have or can pick up at a garage sale plus a diamond-tipped glass drill bit, you're set to go..
Dremel drill with glass drill bit. Water covers glass. Most artists end up using a smaller, lightweight drill, usually a Dremel brand drill or a similar one as seen in the photo. This is because it is much lighter and easier to hold than a household drill, so over time, you avoid wrist fatigue. You also don't need high speeds for drilling glass. A lower speed is better. Most Dremel-type drills have dual or variable speeds. CAUTION: Always drill with the glass completely submerged in water. The glass dust from the drilling process is very bad for you to breathe in, so the water keeps it from floating around in the air. The water also helps keep the drill bit cool. I am new to the art of doing something more than collecting my beach glass and putting it in jars. 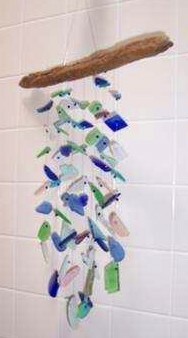 I have wrapped several pieces and am now working on a sea glass windchime. I always wondered if I could do the holes. Now i know what to get and directions I intend to try. DRILLING sea glass - how long? Diamond bits and water are a must. In addition, I use a plunging action. Moving the bit a little up & down takes some pressure off the bit and gives it a chance to cool down. Keeping a steady pressure downward on the bit only keeps it Hot !! How long depends totally on how thick the glass, and how big the hole. If you need a large hole start very small with a pilot hole. Diamond bits must have water on them at all times or you will ruin them. I use a small cake pan 1/2 full of water, with a 1/4 to 1/2 inch flat piece of wood in it, lay my glass to be drilled on the submerged wood and use a moto tool with the drilling end under water, to drill. A 1/4 inch piece of glass takes about 5 minutes or less. I also went out and bought diamond drill bits. I have been folding a washcloth so it fits in the bottom of a cereal or soup bowl. Place a piece of glass in the bottom and put enough water in to just cover the glass. You need to keep the bit and glass wet. I also use a variable speed drill so I can control the speed. A nice steady slow speed works great and I am getting about 50-60 pieces of glass with each bit, which is the quantity listed for each bit. I bought expensive drills and broke every one of them. Being Patient I Think Is The Key Here. Too Much Pressure Will Break The Drills. Good drill bit for drilling into small pieces of sea glass? 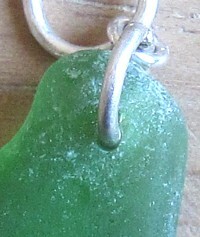 I need to drill medium to small pieces of sea glass and don't know what drill or bits it is best to use. Hi- For drilling sea glass, especially small pieces, you need to use diamond drill bits. These are typically very thin, so you don't crack the glass. We got ours from a gem and rock shop that sold them individually for about $3 apiece. The other parts you need are appropriately-sized cullets (sp. colletts)- of course, just about the smallest you can find. It helps to bring your drill bits (and drill itself) to match to the cullet size. You can find small cullets at any hardware store. Make sure the glass you're drilling into doesn't have a crack already - that could spell disaster! The best resource we found to help us find drilling equipment was the staff at the gem shop we stopped into. Try searching for one where you live - they may be able to give you some good advice. Good luck! Diane's drilled sea glass mobile got quite a few people excited about how to drill glass themselves. Her original post is found at Sea Glass Mobile. I went to a local Jewelry Supply store and they had so many various sizes of Diamond Drill Bits for just a $1.00!!! Works beautifully with the sponge/water method. 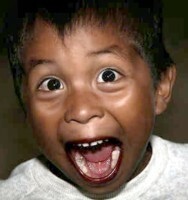 And no...I did not get shocked! :) It works beautifully. Its a 1.25mm bit and fits on my Dremel. I have been finding the most amazing pieces of glass recently. An amethyst colored "butterfly wing" shaped glass, lots of perfect yellows, and pinks. Does anyone know how to price these for sale? There is a local jewelry maker who is interested in buying, but I don't want to undercut myself. I walk 6 miles a day to find these beauties. Also, someone gave me an interesting suggestion this morning on Facebook...to use a dental drill bit. Will look into that also and let ya'll know how that goes. Great site by the way. Use a small metal pyrex dish or something sturdy that you won't cook in ever again. Get a small dish sponge and fill the dish with enough water to cover the sponge so that it's saturated. Put the beach glass to be drilled on the sponge. Start drilling your hole on slow speed at first so that you do not crack your piece. This method works great, it cools the glass from the hot drill bit so that it does not crack. It also lets you see exactly where your drilling and keeps the area constantly flushed with water as you drill. I use a diamond point Dremel 7144 or 7134, and of course a cordless Dremel drill so that you don't get electrocuted. Depending on the size of the beach glass you may want to use a larger bit. Be careful not to get your drill wet but it's OK to get the drill bit wet. Sea Glass Bracelet with drilled "beads"
Ole submitted this drilled glass bracelet and stimulated a lot of interest and a few questions and responses. 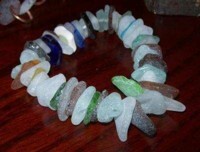 Read his about his drilled sea glass for bracelets. Simply click here to go to Share It!